Looking for a quick and easy paint roller cleaner? 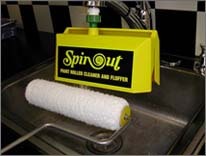 Look no further than Spinout, the paint roller cleaner that makes cleaning your paint rollers easy. The Spinout system allows you to clean, dry and re-use your paint roller in less than 30 seconds making Spinout the solution for easy paint roller cleaning that you’ve been searching for. 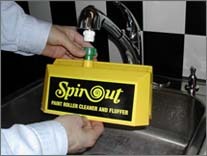 Stay ahead of professional painting competitors by using this innovative solution to a messy problem – once you start using Spinout, you’ll wonder how you lived without it. The four step Spinout method is simple, and easy to use. All you need to do is connect the Spinout to an outside garden hose or a sink faucet in your house, insert your dirty paint roller into the stream of water inside the Spinout. Once the water begins to run clear, your paint roller is clean – remove it from the Spinout and you’re ready to use your paint roller for the next paint application. 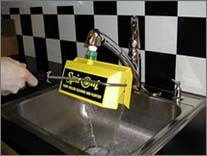 The recently invented and highly effective Spinout is a patented paint roller cleaning system that first premiered on the west coast. Now, this system is manufactured on the east coast and ships all over the country so that everyone has access to a quick and easy paint roller cleaner. 1. Connect The Spinout to a garden hose or a sink faucet using the special adapter. 2. 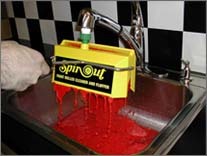 Insert your paint roller into the jet-stream of water inside The Spinout. 3. Remove the paint roller once you see the water running clear. 4. When the “Spinning” stops, you are ready for your next paint application.